Café Tureček is a gallery in a flat runnig as a testing platform aimed in terms of the program at „marginal effect“. Artists test their new projects or methods in front of a limited number of viewers. The gallery has been run by Filip Polanský and Hana Turečková in their flat in Vinohrady since spring 2010. They prepared there exhibitions of for example Michal Pěchouček and Pavel Švec, Yumiko Ono, Ondřej Roubík and others. Tomáš Bárta (1982) displayed two large canvases which he painted for this exact place. 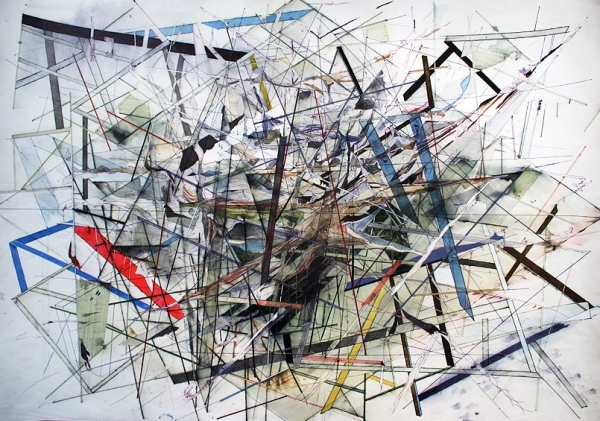 His display refers to a today’s empty revision of modern style, the paintings affect as a sophisticated retro-design in which a report of current situation is enciphered.